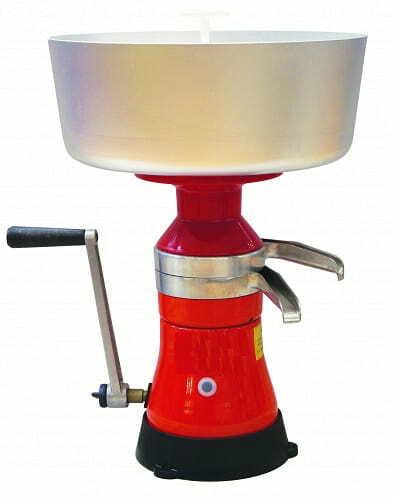 Our Hand-Operated Cream Separator is OUT OF STOCK, but we have ordered more! You are still able to purchase it now and we will ship it to you as soon as it arrives. Questions? Please call 1-800-438-5346 or email us at info@Lehmans.com. Have dairy goats or a cow? Separate the cream from the milk right at home, so you can use the fresh cream to make delectable butter, cheese, even ice cream. Superior to plastic versions, this high-quality, hand-cranked model is durably made of metal. No electricity needed - just turn the handle. We didn't buy ours from Lehman's either....at the time they didn't have one that was affordable. Its well worth buying from Lehmans. We got ours from the Ukraine, worked like a dream on our goats milk....but there's a catch now can't get any replacement parts! Be careful who you buy from......we'll buy from Lehmans as soon as we can afford it. Goats milk! Yes it does that too! I did not buy mine from Lehman's as they didn't have it when I needed it, honestly I got mine cheaper and straight from the Ukraine. Now with that said the directions are a pinch of a challenge and you will need 3in1 oil to make her work! Yes you can separate goats milk - we did it every...single...day! If you don't mount it on a permanent table then someone sort of has to hold it still while the other cranks, until it gets going. Do NOT poor all of the milk in at once. There is DEFINITELY a learning curve, as in we saw milk run all over the kitchen table and on to the floor, be prepared with bar mops/dish towels. Definitely a great separator! Best of luck!